As covered by Conor previously, the wonderful Wii package of the incredibly popular Metroid Prime Trilogy has been released as a download on the Wii U eShop. Despite this download being quite a size, and now no longer as cheap as it was on initial release, I couldn’t recommend that everyone at least give it a try. So, I’ll make the second case for the Trilogy (following on from Conor’s Impressions) by tackling Metroid Prime 2: Echoes. The story for the sequel to the incredible Metroid Prime follows on almost directly from its predecessor. I won’t ruin the ending of the first game, but suffice to say that the events that occur on Tallon IV are no accident (owing to some clever retconning of the plot in the Trilogy release), and certain repercussions spread outwards from this narrative ground zero. Samus receives a distress call that brings her to the planet Aether; upon investigation her ship is damaged by a powerful atmospheric storm, forcing her to crash land. It transpires that the world itself is split into two versions existing in separate dimensions, and the war that erupted between the Luminoth of Aether and the dark and twisted Ing of Dark Aether has brought the Luminoth to near extinction. Enter Samus to save the world of Aether, and also one of the interesting gameplay mechanics of Metroid Prime 2. The split-world dynamic of Aether gives some interesting new gameplay aspects that weren’t in its original, which both make the game longer and harder than its predecessor. The world of Dark Aether, a place where the very air is toxic and damaging to Samus, needs to be explored but (outside the Luminoth light beacons) she will continually take damage on her travels there. There is the additional benefit that the light beacons will restore her health, but these can be nullified by certain Ing. You also will often find objects and machines on your travels that are in dimensional flux, so you will have to travel to the other world to be able to interact with them, and interaction in one dimension will affect both. Aside from this dimensional rift, the gameplay is much the same as the first game (no bad thing – I hasten to add). 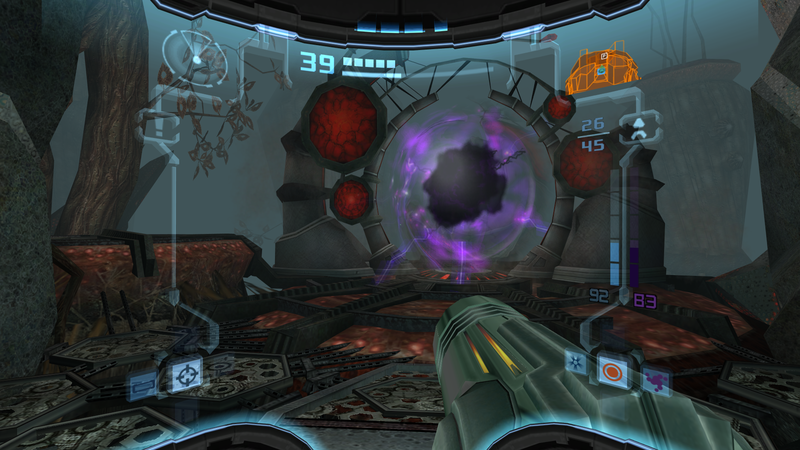 The perspective and basic game mechanics are still that of a first-person adventure game, meaning that you are once again within the visor of Samus. Speaking of visors, there are still various little bits of information that can be found throughout the world using the Scan Visor (whether those are enemy/creature explanations, or technology/machines), once again enriching the world for those that wish to immerse themselves in it. What a world too – Echoes is absolutely stunning. 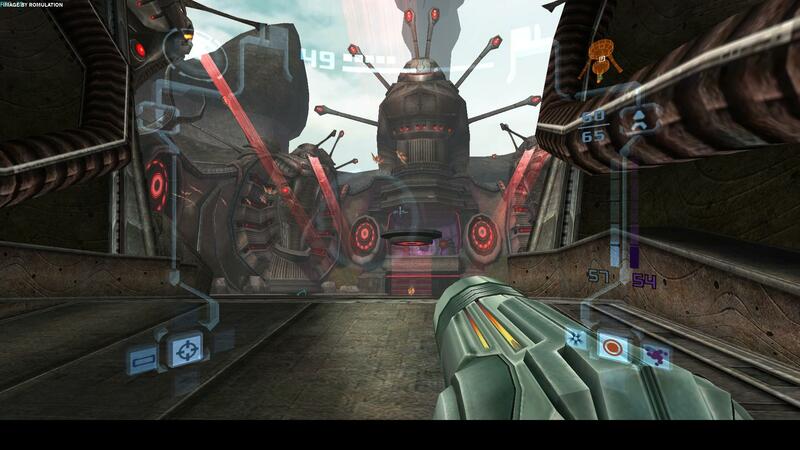 Much like the original Metroid Prime, the game is beautiful in almost every way. Aether is wonderfully realised and, to arguably a greater extent than Tallon IV, a believable world within the lore of the franchise. The lighting effects are one thing that I notice more than anything as being near on perfect, even by today’s standards. Also, I have to give a little time to the music as this game has an incredible score, once again showing Yamamoto’s prowess in creating beautifully haunting music. I can’t really argue that the music is better than the first game, because I simply couldn’t choose between them. 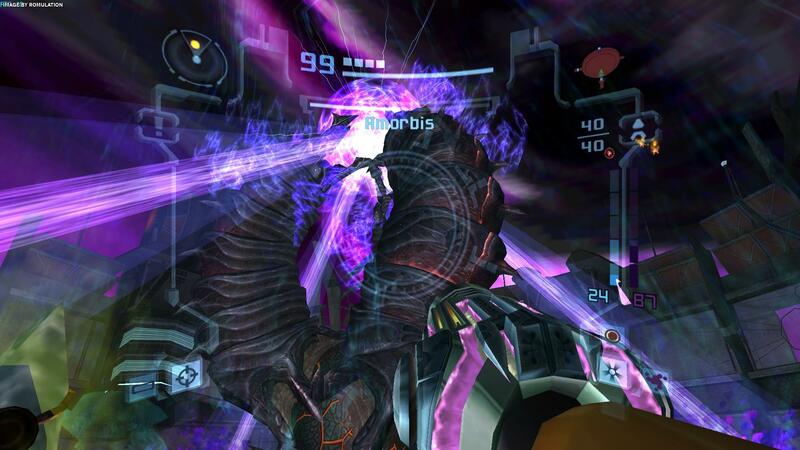 Should you get the Metroid Prime Trilogy? A resounding yes, in fact I would go as far as to ask “why don’t you have it yet?”. Everything that the first game has, the second one does bigger and better. More locations, items, power ups, and enemies. I would argue that the price of the trilogy on the eShop is worth it just for Metroid Prime 2: Echoes, what are you waiting for?